Last year, after seeing book recommendations fly back and forth between my far-flung cousins and aunts on Facebook, I started an online family book group. It’s been such fun to share great books with my family whom I don’t get to see very often, and there have been some excellent selections (we take turns choosing). 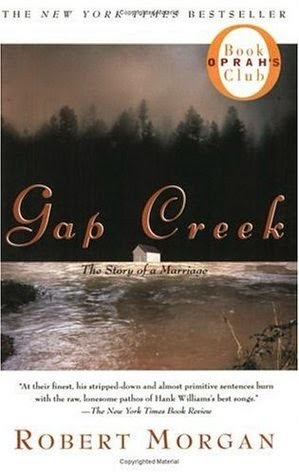 My cousin’s latest pick, Gap Creek by Robert Morgan, was no exception – we all enjoyed it. This historical novel is set at the turn of the century in the rural Appalachian Mountains. The Harmons are a loving, close family who eke out a living with their small farm; the story is narrated by Julie who is 17 and has 3 sisters and a younger brother. Life is hard, but they are happy. Then tragedy hits. The young boy, Masenier, dies of some sort of untreated infection with high fever. Julie and the rest of her family are devastated by his death. Meanwhile, her father’s “coughing sickness”(probably TB) gets worse and worse, and things look grim for the Harmons. Julie is hard-working, and with her brother gone and her father sick, she has to take on much of the work normally done by males on their farm. Soon, though, a young man named Hank comes to the area and “courts” Julie in a whirlwind romance. Within a week of meeting for the first time, they are married, and Julie heads across the border to South Carolina with Hank to a small cabin in an isolated valley. They live with a cranky old man who owns the cabin, in exchange for cooking and taking care of the house. This farm is even smaller than the one Julie grew up on, with poor soil and a short growing season. Their life is incredibly difficult, and tragedies occur often in this time before there was any real medical care. Much of the novel focuses on Julie and Hank’s new relationship and whether or not it can withstand the hardships and tragedies they encounter. We were all fascinated by the details of life in the late 1800’s and especially by how difficult it was to do the simplest things. We will never take a pork roast or a trip to the grocery store for granted again! Most of all, we were all inspired by Julie’s strength and her optimism. Although there is a lot of misfortune and heartbreak in this novel, ultimately, it is an uplifting story of overcoming adversity and not giving up when life gets hard. NOTE: The Road From Gap Creek is a sequel novel, narrated by Julie's child, extending through the Depression and World War II. Wow! This sounds really good. I'm adding this to my ever growing list. This sounds really good and is by a publisher local to me. I am going to have to check it put. Thanks for sharing with #SmallVictoriesSunday #linky! Pinning and sharing. It's Monday 4/28! What Are You Reading? It's Monday 4/21! What Are You Reading? It's Monday 4/14! What Are You Reading? It's Monday 4/7! What Are You Reading?